The Crufts dog show was won just a couple of weeks ago by Yogi, a Hungarian Vizsla – the first time that the Best in Show was won by that particular breed of dog. This started us thinking about how many different breeds of dogs had actually won the show, and where you could find a full list of the Best in Show winners. 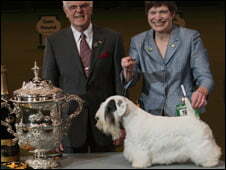 The Crufts website itself doesn’t seem to hold this sort of information – even for recent winners – so we’ve compiled this up to date list of the Best in Show winners at Crufts, from Yogi’s success just a couple of weeks ago, Charmin’s victory last year (a Sealyham Terrier) to as far back as 1928. We’ve also listed, where possible, each dog’s Kennel Club name. Those familiar to dog breeding and dog shows will know that the letters ‘Ch’ before a dog’s name show that they are a champion of two or more major shows.